is an international, Paris based, prize to encourage development and renewal of puppet theatre arts, distributed every two years since 2006. 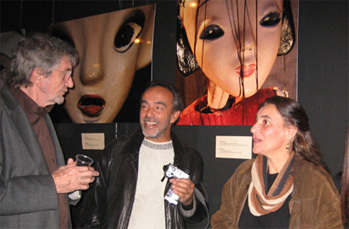 2006 Antigoni Paroussi, Athens University, Greece, for "having introduced puppet theatre training at university level, for her dedicated efforts to increase the consciousness of quality amongst the young and for her contributions to the Hydra International Puppet Theatre Festival, Greece". 2008 The Nang-Yai Performers of Wat Ban Don, Thailand, "for the encouragement of new generations to preserve and renew the Nang-Yai tradition faithfully to its origins..." including a performing tour to Athens, Greece and Lund, Sweden. 2010 Mohammed Shameem New Delhi, India, puppet maker and performer at the Ishara Puppet Theatre Trust and founder of his company, "for being a good representative of the developement and renewal of traditional puppetry". 2012 Bernd Ogrodnik, Borgarnes, Iceland, "for the example he offers to new generations of highest craftsmanship quality and renewal of technique and construction, particularly as in the film "Strings". 2014 Piewnam Charlermyart, The Semathai Puppet Theatre, Bangkok, Thailand, "for promoting puppet theatre in Thai society by developing the Semathai company’s own repertory, encouraging free individual creativity amongst children and initiating the Harmony String Puppet Festival at Amphawa". 2016 Bashar Sahyouni, Stjärnhov, Sweden, "for creating The Syria Puppet and Theatre Club together with other refugees at Solbacka refugee camp, integrating personal experience and artistic creativity". 2018 The Leksands marionett- och figurteaterförening “for the foundation of a new centre in Leksand, Sweden and it´s members search of knowledge and quality”.